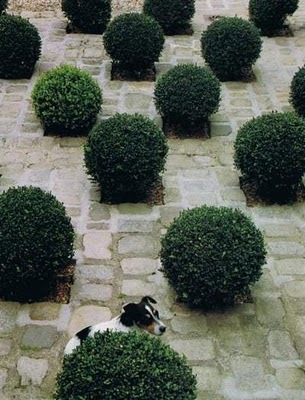 I am obsessed with boxwood. I have them in pots on my front and back porch and even have hedges leading up to the front door. I love how easy they are to care for and they look so classic and elegant in any outdoor setting. So, as you can imagine, this picture made my heart skip a beat. And the little doggie, icing on the cake!